Experiencing dryer eyes than normal? We are here to discuss some of the best eye drops for dry eyes on the market today. The best eye drops are ones that are gentle without any irritation that also don’t worsen the condition you are using them for. It can be scary to drop foreign liquid into your eyes, so make sure you know as much about the drops you are using as possible. First let’s talk about how we choose our ratings for the best eye drops for dry eyes. It is very important to us that we are ensuring our reviews are honest and accurate. To do this, we take a few additional steps in our research to make sure it is completely thorough and correct. We make sure to read and research online customer reviews and testimonials. This allows us to get a broader view of what the general public thinks of the product in question. It also gives us insight on any widespread issues or complaints that might not show up anywhere else. We are also able to gather quite a few pros and cons from other customer reviews as well. We also make sure to thoroughly research the product specifications. By doing this, we are ensuring that if any of our readers buy the product we are reviewing, they know exactly what they are getting. There won’t be any surprises and/or confusion when receiving the item in the mail. This also allows us to identify any potential drawbacks that the product may have as well. Lastly, we make sure to research the company that makes the items thoroughly. It is important to most customers that they are purchasing products from businesses that they can trust and stand behind. This also gives us insight on a company’s customer service policies, as well as their warranty and return policies. For this list of the best eye drops for dry eyes, we will be considering a few different factors. Pricing, how gentle it is, effectiveness, and overall performance will all be considered. If you need a great and gentle way to treat the occasional dry eye symptoms, using Blink Tears Lubricating Eye Drops is a safe option that you will love. The main ingredient is polyethylene glycol, which does a great job of mimicking your eyes’ natural mucous membranes to relieve the irritation. The drops are aqueous artificial tears that are gentle and absorb rapidly without any irritation or cloudiness. These drops also contain sodium hyaluronate, which is a lubricant that’s produced naturally by your eyes in response to ocular surface damage. This ingredient also helps retain water, control inflammation, and lower viscosity when you blink – which decreases the sensation you get of having something in your eye. If you are someone who has consistently dry eyes, you may have better luck with a lipid-based product than with an aqueous drop. Using lipids help thicken the outer layer of your tear film to keep any moisture from escaping, which is often the underlying problem. These eye drops rely on two active ingredients to help soothe your eyes: propylene glycol and glycerin. The items promote cell growth, reduce inflammation, and also thicken the natural lipid layer of the tear film. You normally don’t need to use lipid-based drops as often as aqueous drops, because they don’t evaporate as rapidly. However, with these Bausch and Lomb Soothe Preservative Free Lubricant Eye Drops is free of preservatives, so it’s gentle enough to be used on a regular basis. It’s also a little more affordable than other preservative-free options, which are normally fairly expensive. If you’re looking for some instant, fast-acting dry eye relief, NanoTears MXP Forte may be your best option. It does a fantastic job of relieving irritation, burning and discomfort due to the dryness of your eyes or over exposure to the sun and wind. The Nano Technology ensures that you experience less blurring and better adhesion, and the product is conveniently packaged in single-use vials. NanoTears was created to address both evaporative dry eye disease and aqueous dry eye disease. Their patented nano-lipid technology creates a clear colloidal lipid solution. The nano-sized lipids, in both non-polar and polar form, replicate the lipids produced by the meibomian gland. The nano-phased lipid component in NanoTears help lower your tear osmolarity by restoring and repairing the surface lipid layer, which reduces tear evaporation and allowing for proper aqueous buildup and dilution. 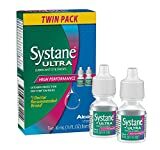 Next up we have Systane Ultra, which offers the ultimate experience in high performing dry eye therapy. Your eyes will feel extended relief, and you will have fewer interruptions in your day to day life. 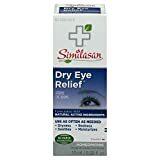 This product really helps your eyes feel more lubricated and refreshed and is especially recommended for those with severe dry eye issues. This product is provided in vials that are completely free of preservatives. They are recommended by doctors and completely sterile, so you don’t have to worry about any chance of dirt or infection. The symptoms will melt away very quickly and will last longer than the average eye drop. While the product is provided as a drop, it actually acts like a gel, which provides enhanced lubrication for your eyes. TheraTears is another option that offers the ultimate relief for dry eye therapy. The unique hypotonic and electrolyte balanced formula actually replicate healthy natural tears. These drops actually become preservative free once they come into contact with your eyes. They are sterile and provide your eye with lubrication and are incredibly popular among those with dry eye. This item took eighteen years of research by ophthalmologist Jeffrey P. Gilbard, MD. It works best on those with mild up to moderate DES. Every time this item is purchased it supports the Schepens Eye Research Institute, which works to fight painful eye conditions and blindness. Next up we have Refresh Optive Advanced, which is actually the eye drop recommended for Lasik Dryness after the Lasik Surgery. It’s long lasting, preservative free, and will do an excellent job of soothing and protecting your eyes from irritation and dryness. This eye drop formula is scientifically advanced through an incredibly innovative, preservative-free, triple-action formula. It has been clinically proven to relieve any burning, dryness, and irritated eyes. Soothing Relief: Helps relieve minor eye discomfort and irritation quickly. Gentle Protection against further irritation. The GenTeal Lubricant Eye Drops are perfect for people who have mild to moderate DES. It was created by pharmaceutical giant Novartis, and they have made a product that lubricates the eyes and provides advanced hydration for better, more long-lasting relief. This product is different from the other eye drops on the market because it also includes genaqua in its formula, which is an incredible protectant for your eyes. Because it doesn’t include any preservatives, it is safe for long term and frequent use. Bion Tears Lubricant Eye Drops are made to be a tear substitute for people who have incredibly severe, chronic DES and who require drops that they can use many, many times throughout the day. This product is completely free of any preservatives and are fully sterile. The company that makes the item suggests that you test them out on your eyes for about three to four full weeks. If you go through that full trial period with no relief at all, you are able to get a full refund for your purchase. This is great if you are worried about spending money on a product that may not work. Boiron is a family run company that has been going strong since 1932, when they started by providing homeopathic relief for various illnesses and conditions. They believe in making people feel good through better treatment, are have set themselves apart as one of the global leaders in homeopathic medicine. The Optique 1 eye drops have absolutely no known drug interactions, are extremely refreshing and soothing, and are a great benefit to eyes that are red, burning, tired, gritty, itchy, and/or dry. Last but certainly not least we have the Similasan Dry Eye Relief Sterile Eye Drops. This is another homeopathic, herbal remedy that a lot of people swear by. Those who use this and suffer from dry eyes have had quite a bit of success with experiencing relief from irritation and dryness. This product is completely free of all preservatives and sterile, making them safe for your eyes. The item is also fantastic with helping your eyes with reflex watering as well as redness and dryness. The company Similasan produces a number of different targeted eye relief drops, including eye drops for allergies, aging eyes, children’s eyes, severely dry eyes, etc. Before deciding on a eye drop solution for yourself, there are a few qualities you should consider. Make sure that you have a set budget in mind before making your choice. There is a vast difference in pricing between all the eye drops on the list, so knowing what you can afford to spend on them beforehand will help you narrow your choices down easily. You should also consider what you are buying this product for. Do you have extremely dry eyes that need to be tended to frequently throughout the day? Or do you only have dry eye symptoms occasionally? Each of those products serves a different need, so make sure you are getting something that fits the symptoms you have. We hope you enjoy our list of our favorite and best eye drops for dry eyes. No matter what sort of issues you are having, we are sure one of the options on our list can easily help you out. Which product on the list are you the most interested in trying? If you have tried one of these eye drops already, what were your initial thoughts on it?